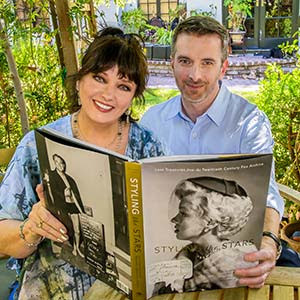 A friendship with rising star Tom McLaren playing a role (pun intended) regarding reviewing the April 4 2017 soft-cover release of Styling the Stars: Lost Treasures from the Twentieth Century Fox Archive, which is a joint labor of love by McLaren and "Lost in Space" and "Sound of Music" star Angela Cartwright, is very apt. The roughly 20-year friendship between McLaren and Cartwright is behind the latter calling the former to propose ala Judy Garland and Mickey Rooney putting on a show that they co-author Styling. The Nelson/McLaren friendship dates back to the former reviewing the June 2016 DVD release of the comedy "All-American Bikini Car Wash" in which McLaren does a great job as the (non-balding) Mr. Belding to a group of "Saved by the Bell" clone college kids in Las Vegas. The traditional first-year anniversary gift being paper makes receiving a press copy of Styling from publisher Insight Editions a few weeks ago even more apt. The Midwest boy in Tom likely likes the humor in stating that he and I are of one mind and that I currently am using it to write this article. That fly-over sensibility also relates to both of us being loving parents to rescue cats. Another basis for a friendship with McLaren is being co-members of what he describes as the "afternoon TV reruns generation." We both have fond memories of spending the period between school and dinner watching classic "unreal TV" fare from the '60s and the '70s. McLaren further shares fond memories of the films from the Golden Age of Hollywood that spans from the '30s to the '60s. We both recall watching these movies primarily on sick days and during the weekends back in the dark days before cable television (and even remotes). As shown below, Styling is a dream come true for McLaren in that it perfectly combines his love of "TV Land" shows and Hollywood classics. Also as shown below, the book being a memorial to his deceased parents makes it that much more special. The aforementioned high regard for the best of the escapist fare on the small screen by McLaren included strong adoration for his "hands down" favorite "Space." Like many boys for whom astronaut powder-drink mix Tang was a treat, McLaren shared that that show was his favorite to the extent that he fantasized about being boy hero Will Robinson. He stated as well that Carwright's girl genius character Penny was another idol. This love of the show prompted new Los Angeles resident McLaren to attend "Space" events at which Cartwright appeared. Casual conversations around the time of the 1998 release of the "Space" movie led to art gallery curator Cartwright inviting McLaren and his spouse Mary to attend an exhibit at the gallery. That was the beginning of a beautiful friendship. The aforementioned Gen X fanboys can only fantasize about McLaren being able to causally text Cartwright about grabbing a coffee; his friendships with Will portrayor Bill Mumy and "Space" co-star Marta Kristen make us want to be him. 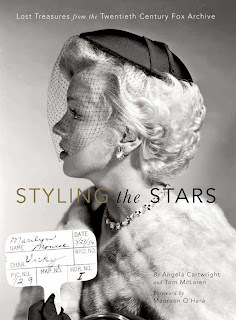 Cartwright doing research in the Fox archives for photos of her and her "Music" co-stars for the 2011 book The Sound of Music Family Scrapbook provided the genesis for Styling. While there, she discovered boxes and boxes of photos from movies and movies in a room that McLaren described in a manner that evoked thoughts of the warehouse in "Raiders of the Lost Ark." His description that "most of it hasn't been touched for decades, maybe not ever" enhanced that vibe. That treasure trove of continuity photos that McLaren described in our talk as "pristine little treasures by themselves" prompted Cartwright to contact former Warner Brothers executive McLaren about collaborating on Styling. The beauty (pun intended) of the Cartwright/McLaren partnership was that this dynamic duo came to the table with a shared love and knowledge of classic films. Cartwright also brought her artistic talent for evaluating things such as composition and lighting, and McLaren put his career-related project management skills to good use. His apt Hollywood-style description of that perfection was that "the stars were magically aligned." The aforementioned Unreal TV article on Styling includes an overview of the nature of the photos. A thumbnail of that portrait is that Fox had those images taken ONLY to help ensure that the appearance of the portrayed character remained constant throughout a scene. A simplified hypothetical example was the director looking at a photo of a man wearing a button-down shirt to ensure that editing footage from two separate days of shooting did not result in the man mysteriously going from having only the top button unbuttoned to having the second button open as well. The rest of the story was that the availability of these genuine works of art by professional photographers would have been limited to an occasional image on a DVD or Blu-ray release of a film if not for those meddling kids Cartwright and McLaren. McLaren further shared that his childhood love of movies provided only part of his motivation for the literal sweat and the figurative blood and tears that he devoted to the project. 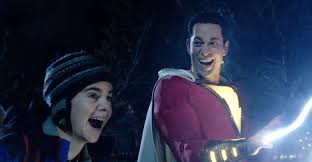 He wanted to honor his parents by ensuring that the wish list that he and Cartwright prepared to guide their search of the archives (which were organized by film) included as many favorite films and stars of his parents as possible. The awesome result that gave the McLarens even more reason to be proud of their boy was that he and Cartwright succeeded in getting virtually every desired star into the book. Betty Grable was a standout among that group. Gene Tierney and Robert Mitchum being favorites of the father of McLaren got those stars onto the pages of Styling. The next step of the process required that Cartwright and McLaren don "little white gloves" and look at the negatives of the photos through "a little light box." McLaren stated that we wanted to be sure that the initial wishlist of stars and films that guided the process included favorites of both he and Cartwright. The Fox archivist would then give "Judy" and "Mickey" the boxes that contained the photos from the requested films. The 1958 film "In Love and War" was a perfect example of both the motivation and the approach of McLaren and Cartwright. One reason that they included the film was because it was the first film in which Cartwright sibling Veronica appeared. McLaren noted as well that no one had looked at the continuity pictures for that film for decades. Enthusiasm related to another child star was expressed by stating "Shirley Temple is Fox of the '30s. She had to be (AND IS) there." A chosen picture of Temple combing her famous curls in one of the few that is not from a film. The other Styling images of this littlest rebel are from her movies. The photos never being meant for public consumption intentionally sets Styling apart from the large number of coffee table books of its ilk. This is very obvious just from looking at the cover. The clear blonde fuzz on the face of Marilyn Munroe, who is considering one of the all-time great Hollywood beauties, demonstrates that these image was not taken for press releases. On a related note, many of the chosen photos reflected the true personality of the subject. McLaren directed your not-so-humble reviewer to the "Young Lions" in the book for examples of this. These include Sidney Poitier looking very relaxed and happy on the set of the 1950 film "No Way Out." The guiding principle related to this topic was that Cartwright and McLaren insisted that any photo used not have been retouched. This related to the oft-mentioned emphasis on authenticity in the book. The fact that the information provided above only is roughly 70-percent of what McLaren shared in our conversation made it into this lengthy article provides a sense of the tremendous effort that he and Cartwright devoted to Styling. He concisely expressed this as "the book was very complicated to bring to print. It is amazing we got it out." These comments were in the context of producing a documentary on Styling itself and on the making of it. One can only hope to see such a film hit art-house screens sometime in 2019 or 2020.